Editor’s Note: This Care2 Favorite originally published in April 2017. We are bringing it back just in time for asparagus season! Of all the seasonal vegetables, asparagus stalks are perhaps my favorite. While available year-round, spring is truly the best season for fresh asparagus. Farmers harvest crops from late February to June, with April being the very peak of the season. I love the bright, fresh taste of asparagus. I always pick up a few bunches when I see it’s on sale. These tall, slim delicious-tasting stalks pack a serious nutritional punch. Asparagus is a very good source of vitamin K, C, A, and the B vitamins B1, B2, B2, and B6. It’s an excellent source of the B vitamin folacin which is essential to the formation of red blood cells. The spears are also full of minerals like manganese, copper, phosphorus, potassium, and selenium. They even have fiber and some protein! All with no cholesterol or fat and less than four calories per spear. There are three varieties of asparagus that are commonly spotted at markets; green, white, and purple. White asparagus is grown by covering the plants with soil as they grow to prevent light from reaching the shoots. This reduces the overall nutrition. Purple asparagus is a better choice, but since it’s more rare, it might be more expensive. To get all the wonderful flavor of asparagus without sacrificing nutrition, choose the green variety. Another asparagus benefit? Because asparagus grows so quickly, it is typically not treated with pesticides and other chemicals. 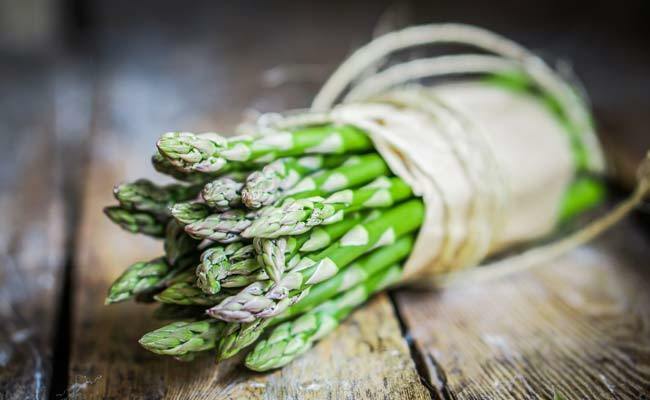 In fact, asparagus is number eight on the Environmental Working Group’s Clean 15 List of fruits and vegetables with the lowest occurrence of pesticides! You’ll find asparagus in tightly-wrapped, rubber-banded bunches in the produce section of the grocery store. If you have local farmer markets in your area, you might also be able to find them during the peak of asparagus season. Look for bunches that contain plump, straight spears. Inspect the bottom of the bunches and discard any bunches with dry, split stems as this can be a sign of older produce. The asparagus heads should be firm and compact, and the stalks should be firm and unblemished. Choosing thick or thin asparagus is a matter of personal preference – thick spears will have a meaty texture, while thin spears are more tender and sweet. Choose the one that suits the preparation or the recipe. Once you bring them home, keep asparagus bunch wrapped with the rubber band. Next, trim an inch off of the bottom of the stems. Fill a glass or mason jar with an inch or two of water. Store the asparagus upright in the glass, making sure all the ends are in water. Loosely cover the asparagus tops with a plastic bag and store in the refrigerator for up to a week. Don’t forget to check the water regularly, change it whenever it looks cloudy. To clean asparagus, simply run the stalks under cool water, gently massaging to remove any dirt or grit. Before using asparagus in recipes, you’ll need to remove the woody part of the stem. Asparagus stems will naturally snap where the tough part meets the tender stem, so simply snap the stems using your fingers. Sometimes, the bigger the asparagus stalk is, the more it can develop a tough outer skin. It’s not necessary, but you could peel the outer asparagus skin using a simple vegetable peeler. If you do decide to peel, take care not to over-peel. Personally, I prefer to leave the skins on. Don’t forget to save any trimmings for homemade vegetable broth! While cooking asparagus couldn’t be easier, there are a few things you should know to help get the perfect dish to the table. The first thing to know is that asparagus can go from cooked to over-cooked in the blink of an eye. Perfectly cooked asparagus is sweet, tender and has a bit of bite in it. Under-cooked asparagus will be tough and hard to chew, while over-cooked asparagus is limp, mushy and unappealing. It’s always a good idea to watch the asparagus closely as it cooks, and test it once it starts to turn bright green using a fork. Also, make sure you remove asparagus from steamers and pots as soon as they are done cooking. If you can, place them in a big bowl of ice water. This will stop the cooking process and help prevent your perfectly cooked spears from turning into mushy stalks. If you don’t have an ice bath available, simply remove cooked stalks and place them on a large platter or wire rack to cool. One of my favorite ways to prepare asparagus is in an iron skillet. I place washed and trimmed asparagus into an already heated iron skillet. I let them dry roast for a minute or so, letting the outer skin blacken. Then I add a small amount of vegetable stock to the skillet and cook until the asparagus is tender. I top them with a bit of salt and freshly cracked pepper and serve them as an easy side dish. 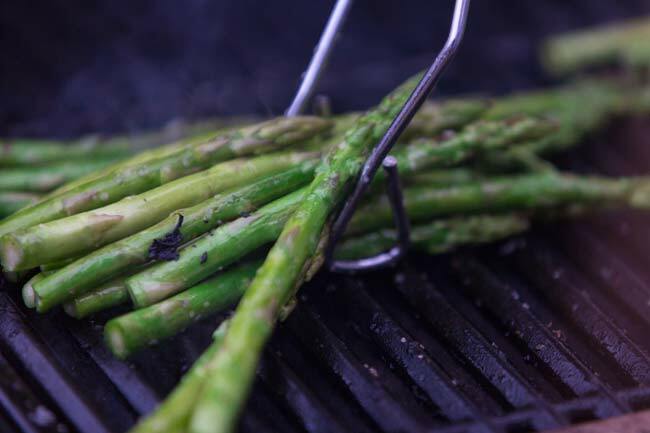 Another common way to prepare asparagus is to drizzle a little bit of olive oil, sprinkle with salt and pepper, and roast them in the oven or on a grill. You can also steam, poach, stir-fry, bake or deep fry asparagus- it’s incredibly versatile. Are you ready to get cooking with asparagus? I found a few asparagus recipes that look and sound incredible, and really highlight one of my personal seasonal favorites. Are you an asparagus fan? What’s your favorite way to use it? Tell me about it in the comments! 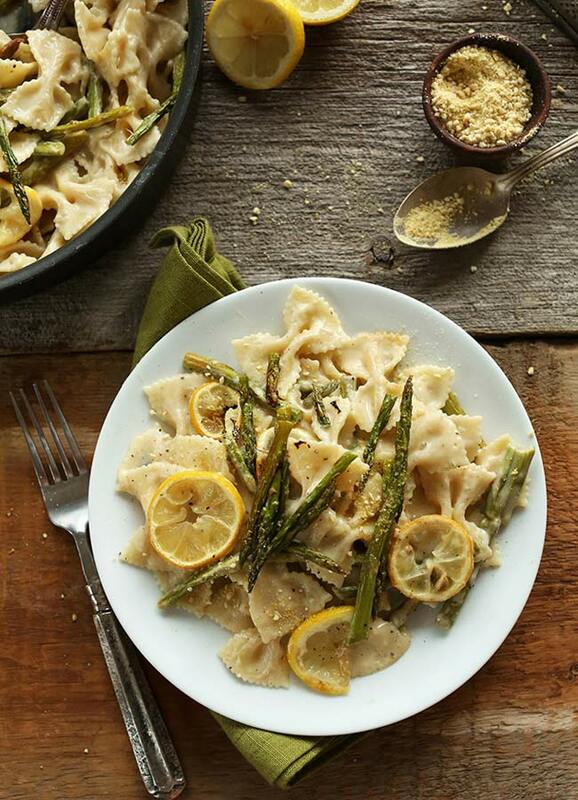 I love asparagus, and can't wait to try the Lemon Asparagus Pasta recipe. Has anyone ever tried them steamed, and served with a mayonnaise, dill weed or tarragon, freshly cracked pink salt and freshly cracked white pepper salad dressing ? I absolutely love asparagus ! Can't wait to try the Lemon Asparagus Pasta recipe. Has anyone tried them steamed, and then served with mayonnaise, tarragon or dill weed, pink salt and ground white pepper, made into a creamy sauce ? If eaten as main-dish these asparagus, then serve to each person of course more asparagus 8 when thick and 10-12 when tin. Another Asparagus recipe: "A la Flamande"
Here most eaten are the white asparagus; these need to be peeled thinly and cut off from bottom about 1,5 - 2 centimeter. Keep this all (wash) as a delicious asparagus soup can be made ! Gook the peeled asparagus like mentioned in the recipe above, but don'r let them cool off too much. During their cooking-time boil per person 1 big or 2 small eggs hard and take egg-shells off and keep eggs warm. Melt (dairy) butter, quantity depends on how many people you are (I would say about 3 (4) spoons p.p., keep warm too (best at the table that butter-bowl to be kept warm). Pre-heat the serving asparagus-plate and your dishes. As an entrÃ©e serve each about 6 (thick) or 10 (when very thin), teach person takes egg(s) and mashes with a fork, then put some warm melted butter on, some grated nutmeg and evtl. some salt and mix all, then eat each bit of the asparagus (when cut by knife plus fork) together with some of the mix. If desired (our family does) you can eat from a small side-plate a slice of nice cooked or smoked ham. Bon Appetit.